Stay on course to reach your 2017 sales destination with Zoho Motivator. Setting sales goals is an essential part of advancing your business in the coming year. But goals are destinations, not directions. And like navigating through a new city in search of a landmark, you need both destinations and directions to get where you’re going. The problem for many sales teams is managers and reps know where they need to go but have no idea how to get there. The key is breaking down larger sales goals into smaller, achievable actions. That way, every person knows exactly what to do to reach his or her objectives. 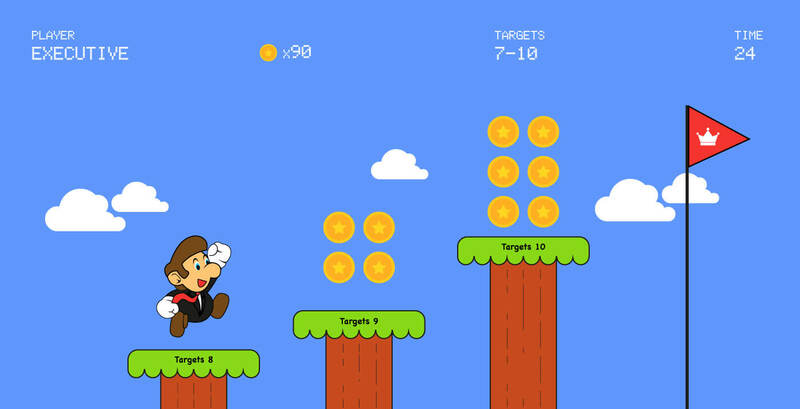 By perceiving goals in terms of key sales behaviors and not dollar signs, reps can focus on completing tasks that accumulate into reaching and surpassing sales targets quarter after quarter, year after year. Like all ambitious goals, sales goals can feel insurmountable. Phrases like “100% growth” or “$1 million in revenue” scrawled across a dry-erase board often intimidate rather than motivate. But when you view sales goals as the destination and daily tasks as the step-by-step roadmap, you can begin to close the gap between the unattainable and reality. The best part of setting goals is that you already know the end. You know exactly what you want to accomplish, and you know exactly where you want to be a month, four months, or 12 months down the road. Say you have a first quarter revenue goal of $1 million. You can use your historical CRM data from the previous year to estimate several important figures: your average deal size, the average number of opportunities per deal, and the average number of calls you made for every opportunity. 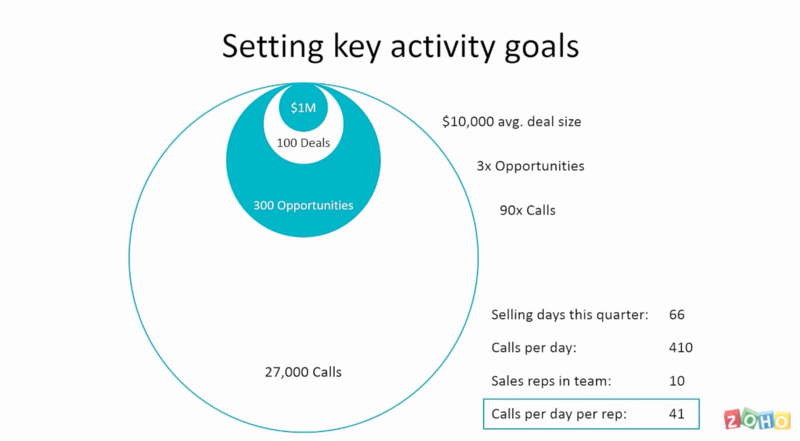 Then, divide the number of calls by the number of sales days in the quarter, and finally by the number of sales reps on your team to figure out how many calls each rep needs to make on a daily basis. You can repeat this process with any metric you like. This is especially useful for beginning sales reps, or for those having a tough month, because it gives them clear guidance on where to focus their time and attention, as well as attainable daily targets. Smartphones and map apps from Google and Apple make traveling and navigating easier than ever. These apps not only give you directions but also turn-by-turn instructions using GPS to ensure you stay on track from start to finish. Now that you’ve broken down your goal into daily actions you can focus on making sure your team maximizes every call and every minute. With Zoho Motivator, sales managers can create and display specific KPIs—like calls, leads created, and deals won—so reps can see if they’re on track with one glance at their dashboard. 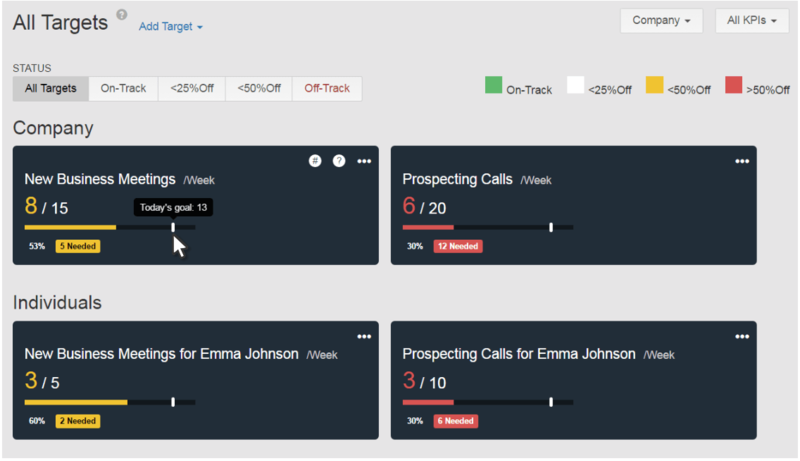 After choosing which KPIs to track and display, convert any of them into a Target so sales reps can instantly see where they are along the roadmap to reaching the goal. If you know it took 10 meetings a month to close one deal, set your target, display it on the dashboard, and inspire your reps to complete the steps that lead to more sales and hitting your goals. By turning your sales team’s attention toward these leading indicators, reps will find it more manageable to reach lofty end goals. Then it’s simply a matter of using Motivator’s dashboards to customize what you track and view. 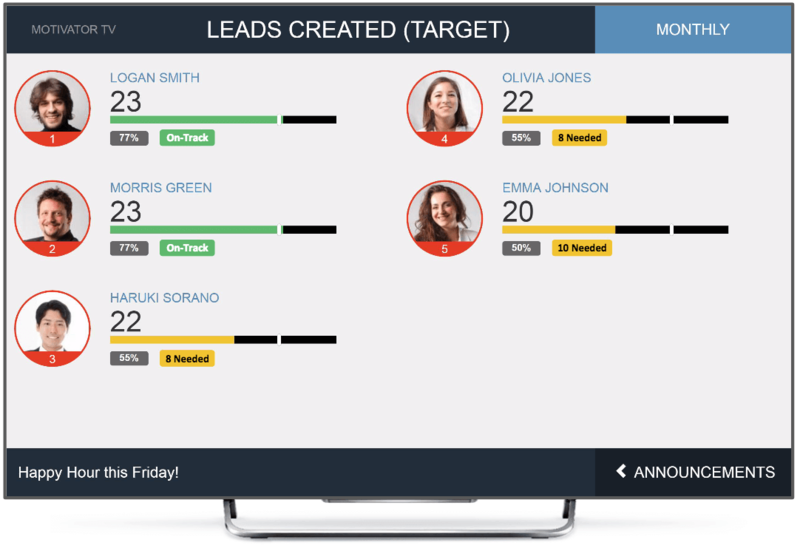 Take it a step further to increase awareness and engagement across your team by broadcasting targets at your office using Motivator TV. Reaching your company sales goals won’t happen overnight. And as any sales manager can tell you, there may be some months or some quarters you fall short. That’s part of sales. And while every organization must set revenue goals, the roadmap is in your hands. Yes, some of these goals are ambitious, but when you spend each day focused on the activities and behaviors you can control, you’ll eventually reach your destination. The new year is here. This is the perfect time to go back to the drawing board and start everything with a fresh perspective. As a business owner, you want to see more sales, and increase your brand visibility. The best way to achieve this is to reflect on your past hits and misses, and come up with a workable strategy for the year. While devising a new business plan for 2017, don’t forget: 65% of your business comes from your existing customers. There are countless ways to attract leads, but customer retention is a whole other story. So how do you keep your customers coming back to you? Engagement is the name of this game, and email marketing is the key. Email is the most common channel of communication with your customers and if properly utilized, will keep you from losing customers to the competition. They bring down the cost of acquiring new customers. They buy more from you because they trust you. They spread the word about your brand to their networks and bring you more business. Now, with that said, here are 7 ways in which you can win your customer’s heart and reward yourself with repeat business. 1. Plug the gap with relevant content. Your customers already know about your brand and your offerings. Engagement for them is all about the extras you bring to their table. It is important that you value their time as much as your own, and tailor your content for each individual. Group your customers based on recency/frequency/value of their purchase, geographic location, etc., to make targeting easier. Add a personal touch to every message you send your customers. Wishing them on their birthdays, anniversaries, or sending a simple thank-you email can be subtle ways to show them you care. Although these messages are automated, your customers will be sure to appreciate your gestures. The best way to make your customers feel connected to your brand is by involving them in discussions about product tweaks and improvements. Conduct NPS surveys asking for suggestions or feedback to measure customer experiences as well as predict your business’ growth. This will not only keep them engaged, but also help you better understand your product from their perspective. 4. Listen to their problems. If you want to take your brand to the next level, be open to both positive and negative feedback. When a customer raises an issue, make sure to respond quickly with a solution to their problem. Don’t stop there, follow up with them once the issue has been solved to improve customer relations. Run a customer-centric email campaign that highlights a customer’s journey with your brand. It can be a case study, a tweet, or a video testimonial. You can use the opportunity to plan some fun events, invite participants, and display the top performing customers in your newsletters. This way, you will be seen as a brand that puts customers first. 6. Reach out to your lost customers. Customers spend a lot of time evaluating a brand before making a purchase. If a customer decides to drop your brand, there is usually a reason. Write to any lost customers to ask them what went wrong and assure them that their complaints will be addressed in order to rekindle your connection. Once your relationship has improved, run a win-back email campaign to keep them updated about any changes that might have been implemented while they were away. 7. Make way for loyalty programs. Every brand wants to stay in the front of their customer’s mind, and running loyalty programs is an easy way to make that happen. Introduce customers to your referral schemes and reward them for every new customer they bring you. Give them free passes to your events, send them discount coupons during a sale, or give away goodies branded with your company logo and message to make them feel valued. Dropshipper Lokal Kuenya Makin Terkikis... Benarkah Demikian? 1. Kompetisi makin ketat, karena barrier to entry ke model bisnis dropshipper kecil sekali, akhirnya orang mudah masuk dan akan bersaing banting-bantingan harga, yang menang adalah yang memiliki modal besar atau yang memiliki biaya rendah. Contoh yang berbiaya rendah misalnya Anda yang memiliki karyawan akan kalah bersaing dengan mahasiswa jika produk dan cara jual yang di lakukan sama. 2. Sumber traffik sudah menjadi komoditas. Keterampilan mendatangkan traffic memang penting tapi saat ini faktanya tidak cukup hanya itu untuk memenangkan persaingan. Siapapun sekarang sudah banyak yang bisa akses FB ads, Google Adwords ditambah lagi sebuah fitur baru salah satu Marketplace terbesar di Indonesia yang mengeluarkan fitur buka iklan alias marketplace + Facebook ads yang di integrasikan. Akhirnya siapapun sudah bisa menggunakan beriklan dengan murah. 3. Platform Marketplace saat ini lebih mendukung ke orang yang memiliki produk langsung dibuktikan dengan berbagai fitur yang memudahkan para pemain hulu untuk menjual produknya langsung ke konsumen tanpa harus harus melalui perantara. Sekarang pun para pemain hulu di offline pun mulai beralih maen di marketplace online. Teknik se-proven apapun kalo sudah di-bombardir banyak orang maka bisa dipastikan akan saturated dan kuenya bakal mengecil. Model bisnis M2C (manufacturer to consumer; pabrik/produsen/importir langsung ke customers) bakal banyak di adaptasi banyak orang, dan saat itu terjadi maka rantai distribusi bakal terpotong. Kenapa ini bisa terjadi, salah satunya adanya kemudahan para pebisnis hulu ini untuk mengakses media pemasaran langsung ke konsumen, salah satunya marketplace. Kalau konsumen udah pada tau di marketplace banyak tangan pertama, dan edukasi pihak marketplace pun massive dengan kucuran dana nya yang luar biasa besar, maka para dropshipper akan kelimpungan karena bagiannya (baca: omsetnya) bakal mengecil. Prilaku konsumen juga sekarang sudah mulai terlihat membandingkan antara produk yang di jual di social media dengan marketplace. Ini adalah salah satu penyebab penurunannya omset para dropshipper, orang bisa aja tau produknya dari iklan yang berseliweran di timeline, tapi decision making process nya terjadi di marketplace. Extremenya bisa aja mereka merasa "tertipu" karena produk yang berseliweran di timeline jauh lebih mahal di bandingkan marketplace, akhirnya adanya disloyalitas konsumen dan mereka mulai berpindah ke marketplace. Saya cek salah satu marketplace mengalami minimal pertumbuhan 4 kali lipat, bisa di lihat dari bid iklannya yang batas atasnya jadi 4 kali lipat dari sebelumnya. karena fenomena ini sudah makin terlihat, jangan salahkan omset turun karena platform social media yang ga work. Tapi mindset & cara bermainnya yang mesti di rubah. makin ke depan di industri ini persaingan ga akan jadi makin mudah, tapi makin sulit untuk yang gak mampu beradaptasi dengan cepat. Anda harus berubah agar tidak terjebak pada persaingan yang gontok-gontkan banting harga, sampai-sampai menjual dengan harga modal dan hanya mengharapkan profits dari cashback ongkir. 1. INOVASI - Untuk mengembangkan sebuah produk, diperlukan ide-ide baru dan lebih baik dari sebelumnya. Anda bisa dapatkan melalui riset dengan menggunakan berbagai teknik dan teknologi. 2. BERBEDA - Lihatlah produk anda, dan sebutkan apa saja yang dimiliki oleh produk anda tetapi tidak dimiliki oleh kompetitor. Fokuslah pada faktor pembeda utama yang dapat Anda pasarkan guna meningkatkan nilai keuntungan untuk pelanggan-pelanggan Anda. 3. VALUE - Berikan benefit dan value yang lebih besar dari yang dibayarkan oleh konsumen. 4. SPESIFIK - Bangun market yang jelas dan spesifik target customernya. 5. TIDAK KUDET (Kurang Update) - Pantau terus tren pasar baik itu secara online ataupun offline, untuk mengetahui tren apa yang sedang ramai dan bisa disesuaikan dengan pruduk atau jasa Anda. 6. PerMUDAH - Permudah cara pembelian, misalnya dengan memiliki semua rekening Bank yang dominan dipakai oleh konsumen. Contoh lain, jika Anda membidik pasar di area sekitar anda, anda bisa menerapkan cash on delivery. Ada sebuah perusahaan bernama Garmin. Mereka memproduksi GPS navigation system yang banyak dipasang di mobil mobil. Dan pada saat itu angka penjualan mereka naik pesat selama bertahun tahun. Dan ternyata dunia dibanjiri smart phone. Tiba tiba orang tidak membeli lagi Garmin GPS system buat mobil lagi. Penjualan mereka pun turun drastis. Bencana ...bencana ... bencana ...??? Contohnya sudah cukup banyak ??? Atau saya harus menyebutkan belasan contoh lagi ??? Charles Darwin ... dalam penelitian di pulau Galapagos menemukan sesuatu yang menarik. By the way, saya tidak percaya evolusi, tapi saya percaya pada kesimpulan Darwin yang ini, "Bahwa makhluk yang paling sukses bukannya yang paling kuat, tetapi yang mampu bertahan dengan perubahan"
bukan yang paling pintar yang sukses (makanya juara juara 1 di sekolah kita dulu sering kali bukan menjadi yang paling sukses dalam kehidupan). Ternyata yang paling sukses adalah yang paling mampu bertahan menyesuaikan diri dengan perubahan. Nah pada saat Kodak dan Nokia mobile phone tidak mampu bertahan, ternyata ceritanya Garmin lain banget. Ternyata meskipun waktu itu mereka jaya dengan product product GPS, Garmin sudah menyiapkan product product dan inovasi di bidang lain... yaitu gadget gadget untuk alat kesehatan dan fitness. Because they are ready for the future !!! Karena mereka siap menghadapi masa depan. Padahal perusahaan perusahaan itu mungkin dulu lebih jaya dan lebih kaya daripada Garmin. Dan mereka tidak mampu beradaptasi dengan perubahan !!! By the way, ini bukan hanya berlaku pada perusahaan, ternyata ini juga berlaku pada diri kita dan karier kita. Dan juga untuk karier anak anak kita kelak nanti. Sebaik apapun profesi yang kita tekuni, bidang yang kita jalani, dan industry di mana kita bekerja tetap saja ada resiko yang mengancam karier kita. Tidak ada yang pasti dalam karier kita. So please, jangan pernah complain kepada perusahaan atau kepada atasan kita dengan mengatakan,"Saya merasa tidak ada kepastian dengan karier saya di perusahaan ini"
It is easy as that. Belasan tahun lalu banyak teman saya mendaftar ke Teknik Sipil dan berharap bahwa mereka akan menjadi Insinyur Pembangunan, pada saat lulus ternyata ada krisis moneter dan pembangunannya di rem. Beberapa tahun lalu anak anaknya teman teman saya pada mendaftar jurusan perminyakan, karena bapaknya pada kaya kerja di perusahaan minyak. Sekarang mereka lulus, dan ternyata tidak ada perusahaan minyak yang merekrut. Boro-boro merekrut, karyawan yang ada saja di PHK. Always always ... siap siap dan mempelajari trend dan bersiap untuk masa depan dengan mempelajari hal baru dan menambah differentiator anda. Selalu mengamati apa yang terjadi di dunia luar sana. Lihat TV, dengerin Radio, browse Internet, baca buku, koran dan majalah. Perhatikan pattern perubahan yang sedang terjadi. Pelajari competency baru, skills baru, dapatkan knowledge baru, sertifikasi profesi yang baru, pelajari bahasa asing lain. Semuanya akan menambah differentiator anda untuk menambah kesiapan anda di masa depan. we dont know what we dont know. Lets be humble and open mind. Kadang kadang anak baru yang masih muda ternyata membawa perspektif baru dan membuat kita belajar dari sudut yang lain. Let's be humble and keep an open mind.